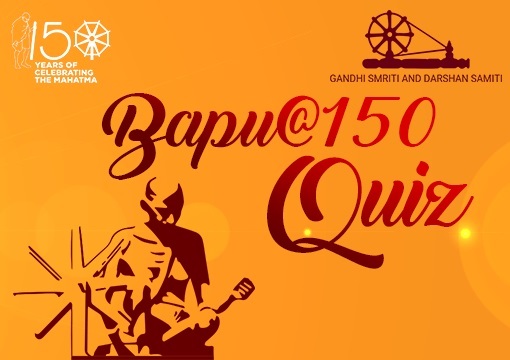 The Gandhi Quiz is being organized by Gandhi Smriti and Darshan Samiti, an autonomous body under the Ministry of Culture, Government of India. The quiz shall open on October 02, 2018 at 12:00 Noon (IST) and will close at 17:00 hrs (IST) on November 14, 2018. Entries received outside of these time/dates will not be valid.Entry into the Gandhi Quiz is open to all entrants who are resident of India or are of Indian origin. You will be required to provide your name, email address, telephone number and postal address. By submitting your contact details you will give consent to these details being used for the purposes of theOnce submitted an entry cannot be withdrawn.Prizes will be given for both Hindi and English quiz. However, a person can be given prize for only one Quiz either for Hindi or English.One entrant can participate only once. Total number of questions each participant has to attempt will be 10 in numbers. Each participant will be given a time of 100 seconds to complete the quiz. The individual coming third will get Rs 11000.00 and Gandhian Literature. Also winners will be declared every week. The weekly winners of the Quiz will be announced on every Saturday after 20:00 hrs.